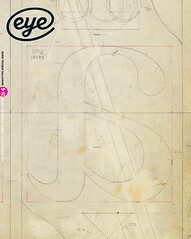 This Eye special issue about Monotype focuses on the technology of putting words on the printed page. But there’s a parallel history of how the pictures get there, too. In many ways the constantly improving techniques of colour picture reproduction explain why lithography superseded letterpress in commercial printing in the 1950s. 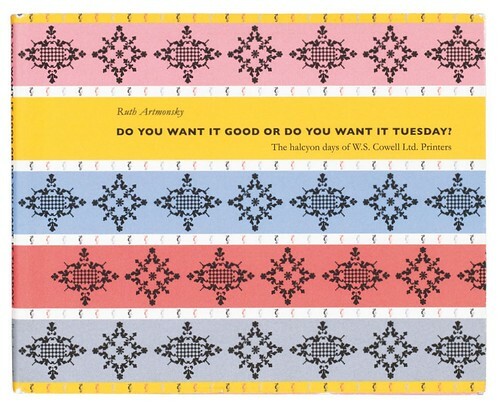 Ruth Artmonsky’s Do You Want It Good or Do You Want It Tuesday? (Artmonsky Arts, £12, design: Webb & Webb) tells the story of the ‘halcyon days’ of printer W. S. Cowell, based in the quaintly named Butter Market in the East Anglian town of Ipswich. With a postwar management team of financial expert Eric Hanson, ex-army works manager Geoffrey Scott and led by joint managing director Geoffrey Smith, Cowells rose from a regional printer to become one of the United Kingdom’s pre-eminent colour book printing houses. This was achieved by an intelligent combination of investment in the newest lithographic printing technology and the remarkable entrepreneurialism of Smith, in particular his promotion of the printer’s own auto lithographic process ‘Plastocowell’, which enabled artists to draw their own colour separations on plastic film that was then transferred to the litho plates. It was both a cheaper and a more authentic result than conventional photographic reproduction (then firmly in the pre-digital era). Cowells’ printing skills led to it producing illustrated children’s books, including English-language editions of Barbar the Elephant, Edward Ardizzone’s Little Tim books and Kathleen Hale’s Orlando, the Marmalade Cat. Artmonsky focuses on a series of key jobs at Cowells. Using the auto lithographic process, it printed the first of Noel Carrington’s Puffin Picture Books for Alan Lane’s Penguin empire (War on Land, 1940). Twenty-five years and 60 books later it printed the last titles in the series. With Eric Ravilious, Cowells made an edition of ten wartime ‘Submarine’ prints (above). Ravilious wrote that Smith was good to work with, ‘because he will take the trouble, and is nice and a socialist, also, so far, his works have not been hit by a bomb’. In the 1960s David Gentleman (see Eye 78) worked with the Plastocowell process on books for the Limited Editions Club of New York, facilitated by Cowells’ monocle-wearing US agent, Martin Simmons. Smith understood the value of subtle marketing and in 1946 he commissioned the press’s new in-house designer John Lewis to produce‘something to show we are in … the illustrated book market’. The result was A Handbook of Printing Types, for which the young and inexperienced Lewis made an illustrated type book, augmenting the display of Monotype faces held in the Ipswich composing room with images from artists such as John Piper, Barnett Freedman and Edward Bawden. The Handbook established Cowells’ reputation as a printer that understood and encouraged good design. In 1960, Cowells commissioned a photographic essay about its business, The Press at the Butter Market, where Geoffrey Ireland’s crisp black and white images captured the scale of the enterprise, from machine room to bindery. To those vivid pictures of industry, Artmonksy has added a sense of the people and the books they were all engaged in producing. Halcyon days. The book is on sale at good bookshops and can be ordered direct from the author, ruthartmonsky@yahoo.co.uk, for £12 including UK postage.